The biggest coastal cities of the Baltic Sea include Saint Petersburg, Stockholm, Riga, Helsinki, Gdansk, Tallinn, Kaliningrad, Szczecin, Gdynia, Kiel, and Espool. The Baltic Sea is a sea of the Atlantic Ocean located in northern Europe. Mammal species in the Baltic Sea at risk for becoming extinct include the harbour porpoise, the Baltic ringed seal, the Eurasian otter, the grey seal, and the harbour seal. The Baltic Sea borders Sweden, Finland, Denmark, Russia, Estonia, Latvia, Lithuania, Poland and Germany. It includes the Gulf of Bothnia, the Bay of Bothnia, the Gulf of Finland, the Gulf of Riga, and the Bay of Gdańsk. The Baltic sea is about 1,600 kilometer (990 miles) long and an average of 193 kilometers (120 miles) wide. The sea has a surface area of 377,000 square kilometers (146,000 square miles). There are many islands in the Baltic Sea including Gotland, Saaremaa, Oland, Lolland, Hiiumaa, Rugen, Aland main island, Bornholm, Kimitoon, Falster, Usedom, and Wolin. 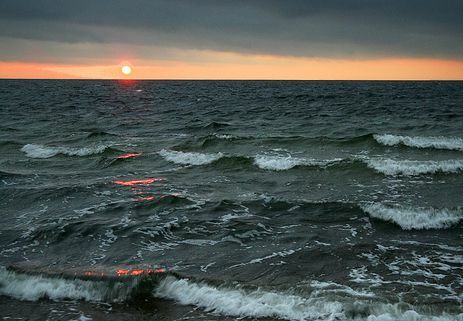 The water volume of the Baltic sea is about 21,700 cubic kilometers (5,200 cubic miles). The maximum depth is 459 meters (1,506 feet) and average depth is 55 meters (180 feet) below the sea’s surface. The Baltic Sea has shore length of about 8,000 kilometers (5,000 miles). Major tributaries to the Baltic Sea include Neva, Vistula, Daugava, Neman, Kemijoki, Oder, Lule alv, Narva, and Torne alv. The Baltic Sea’s salinity is much lower than that of ocean water, as a result of abundant freshwater runoff from the surrounding land, combined with the shallowness of the sea itself; runoff contributes roughly one-fortieth its total volume per year. The Baltic Sea is a brackish inland sea, alleged to be the largest body of brackish water in the world (other possibilities include the Black Sea). It is believed that the Baltic Sea formed approximately 10,000 years ago, following the last glaciation. It is known that since 1720, the Baltic Sea has frozen over entirely a total of 20 times – the most recent case was in early 1987. On average, the Baltic Sea is iced in winter for roughly half of its surface area. The ice reaches its maximum extent in February or March; typical ice thickness in the northernmost areas in the Bothnian Bay, the northern basin of the Gulf of Bothnia, is about 70 centimeters (28 inches) for landfast sea ice. The thickness decreases farther south. The Baltic Sea is home to many freshwater and marine species. Some of these include herring, cod, hake, stickleback, flounder, perch, pike, roach, and whitefish. Images taken by satellite in 2010 showed that there is an algae bloom covering 146,000 square miles in the Baltic Sea, and 38,610 square miles of its sea floor is now a dead zone. In the late Spring and Summer, following the ice melting, sea temperatures rise rapidly. Around the Danish islands and in the Southern Baltic near Kalinigrad, 10 or 11°C (50 or 51.8°F) in May becomes 17 to 18°C (62.5 to 64.5°F) by August. To the south of Gotland temperatures of 5 or 6°C (41 or 42.8°F) in May becomes about 16°C (60.8°F) in August. In the Gulf of Finland a temperature average of just 1°C (33.8°F) in May rises to 16°C (60.8°F) or higher approaching St Petersburg in August. The Baltic is a young sea, formed after the last glaciation as the ice retreated some 10,000 years ago. Commercial fishing in the Baltic Sea is an important industry. The most common commercially fished species include herring, sprat, and cod. There are more than 85 million people living in the region of the Baltic Sea. The fauna of the Baltic sea is a mixture of marine and freshwater species. Among marine fishes are cod, herring, hake, plaice, flounder, shorthorn sculpin, stickleback and turbot, and examples of freshwater species include perch, pike, whitefish and roach. On the shores of the Baltic Sea in Lithuania, Russia, and Poland, amber is an important deposit and industry. Critically endangered populations of Atlantic white-sided dolphins and harbor porpoises inhabit the sea where white-colored porpoises have been recorded, and occasionally oceanic and out-of-range species such as minke whales, bottlenose dolphins, beluga whales, orcas, and beaked whales visit the waters. In recent years, very small, but with increasing rates, fin whales and humpback whales migrate into Baltic sea including mother and calf pair. Endangered bird species in the Baltic Sea region include the Terek sandpiper, the Mediterranean gull, the southern dunlin, and the black-legged kittiwake. Commercial fishing in the Baltic Sea has a long tradition in all surrounding countries. Today, the most important commercially exploited fish species are cod, sprat and herring, with sprat and herring making up around 85 percent of total catches. The shoreline of the Baltic Sea is 5,000 miles in length. In addition to fish the sea also provides amber, especially from its southern shores within today’s borders of Poland, Russia and Lithuania. First mentions of amber deposits on the South coast of the Baltic Sea date back to the 12th century. Countries that border the Baltic Sea include Germany, Poland, Lithuania, Latvia, Estonia, Russia, Denmark, Finland, and Sweden. Much shipbuilding is carried out in the shipyards around the Baltic Sea. The largest shipyards are at Gdańsk [photo below], Gdynia, and Szczecin, Poland; Kiel, Germany; Karlskrona and Malmö, Sweden; Rauma, Turku, and Helsinki, Finland; Riga, Ventspils, and Liepāja, Latvia; Klaipėda, Lithuania; and Saint Petersburg, Russia. During the Roman Empire the Baltic Sea was referred to as Mare Sarmaticum or Mare Suebicum. At the time of the Roman Empire, the Baltic Sea was known as the Mare Suebicum or Mare Sarmaticum. In the early Middle Ages, Vikings of Scandinavia built their trade emporia all around the Baltic. Later, there were fights for control over the sea with Wendish tribes dwelling on the southern shore. Because it connects so many disparate areas of Northern Europe, it was the economic core of the Hanseatic League, an economic alliance of the late Middle Ages. In the eighteenth century, Russia and Prussia became the leading powers over the sea. World War I was partly fought in the Baltic Sea. The Baltic Sea has an abundant supply of fresh water runoff from the land surrounding it, resulting in it having much less salt than the ocean. Runoff from the land equals roughly 25% of the Baltic Sea's volume every year. Endangered species of fish in the Baltic Sea include the eel, the grayling, the porbeagle shark, the spurdog shark, wolf fish, whitefish, ling, sea lamprey, tope shark, thornback ray, salmon, and trout. During World War II, Germany reclaimed all of the southern and much of the eastern shore by occupying Poland and the Baltic states. Since the end of World War II, various nations, including the Soviet Union, the United Kingdom and the United States, have disposed of chemical weapons in the Baltic Sea, raising concerns of environmental contamination. Since 1720 the Baltic Sea has frozen completely over 20 times in total. The most recent case of it freezing over occurred in 1987. Political changes and developments in environmental and maritime law caused a new convention to be signed in 1992. The Convention on the Protection of the Marine Environment of the Baltic Sea Area, 1992, entered into force on 17 January 2000. During the early Middle Ages the Baltic region was a trade empire of the Norse. This is referred to as the Viking Age.